And I sure loved sharing the eats with you here and here on Twitter. These Homemade Peanut Butter Cups will restore your faith in everything — the super creamy peanut butter filling, the rich and sweet milk chocolate coating. It’s like comfort on top of comfort. You know, for those extra tough days. These are comforting, rich, sweet and decadent — just like the storebought version — but without the excess calories, fat, sugar and strange additives (PGPR) and preservatives (TBHQ). You know, I can resist some things but definitely not these Healthy Homemade Peanut Butter Cups. Far from it. I had a hard time NOT eating every single one of these in five seconds flat… ummm, I kinda finished them all the same day I made them. But that’s not a problem, they’re healthy and totally guilt-free. Question: What’s better than one Peanut Butter Cup? Answer: TWO Peanut Butter Cups! Take it from me — always keep a batch of these on hand! Why? In case of emergencies, duhhh. 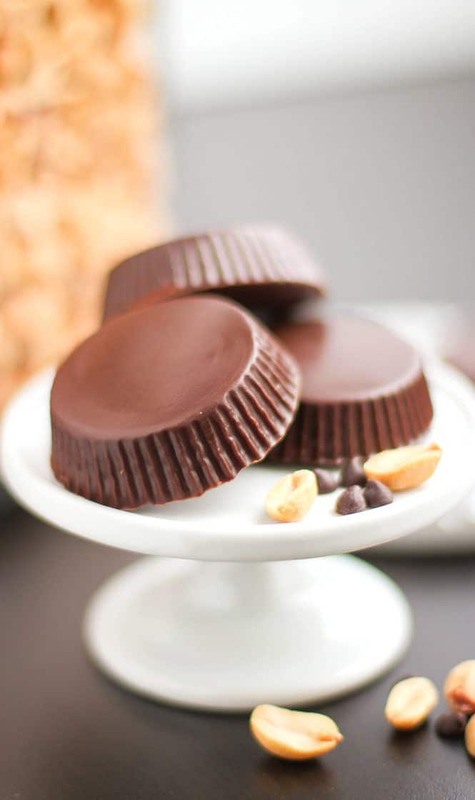 These healthy homemade Peanut Butter Cups are totally nutritious, sugar-free, low-carb, gluten-free and guilt-free! Spoon ~1 teaspoon of the melted chocolate into 8 cavities of a peanut butter cup mold. Rotate the tray at an angle to coat the cavity “walls” with the chocolate. Place in the freezer while you make the filling. In a medium-sized bowl, whisk together the erythritol, peanut flour and salt. Stir in the yogurt. Mixture should be thick, like frosting. Scoop the filling into the chilled chocolate cups. Do not overfill. Spoon the remaining melted chocolate over the filling. Refrigerate until firm. Serve immediately, or store in a tightly sealed container in the fridge for up to 1 week. 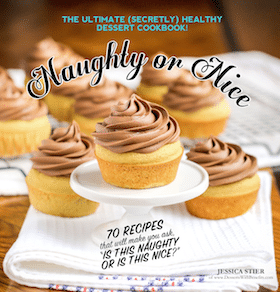 I originally wasn't going to share the recipe here because I worked so incredibly hard on publishing Naughty or Nice. But I wanted to provide it here because that way, you can determine whether or not the cookbook is for you! Saw these this morning….. went to the store, bought the ingredients I didn’t have, made them…. SO GOOD. Your recipes are my favorite; I’ve been on a baking spree with them 🙂 Next up- Peanut butter fudge! I hope you like the Peanut Butter Fudge as much as these! Can I use truvia and blend into making a powder? 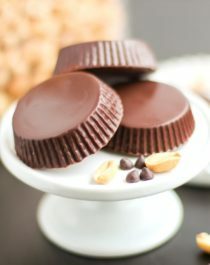 Peanut butter cups were my favorite before my son was diagnosed with a peanut allergy. We prefer Sunbutter over Soybutter. Any idea how to make this with Sunbutter? I haven’t tried replacing the peanut flour here, but you can try swapping the flour with sunbutter instead. It should firm up after refrigerating. I hope you guys like the recipe! Where on this page can I find the reciepe? Wow, just made these and they are wonderful!!!! PB cups are my weakness so I’m so thankful to have a healthy alternative. Thanks a million for the recipe!!! Couldn’t you make the chocolate part with unsweetened dark cocoa powder? I’m a newbie to this low-carb, sugar-free way of life and I’m finding it extremely difficult to find desert recipes that don’t require baking or very many ingredients..You see, I don’t enjoy cooking and have never baked a desert outside of a bundt cake and don’t have things in my cupboard like peanut flour and powdered erythritol..My question is, am I able to substitute the peanut flour for another flour like say coconut or almond and sweet leaf stevia in place of erythritol? Also, can you recommend any other desert recipes that are no bake requiring very few ingredients that are of the peanut butter, coconut and chocolate variety? I totally understand! This new “way of life” is a complete shock sometimes, especially when you find all these ingredients you’ve never heard of. Unfortunately, in this recipe, the peanut flour is required. 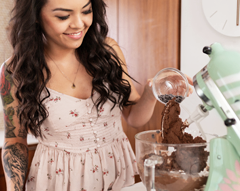 It’s what gives the PB cups that PB flavor, and it also helps create a nice and fudgy texture (it’s really delicious… peanut flour is versatile and can be used in a ton of things, like PB frosting and even a savory peanut butter sauce). I haven’t tried this recipe with stevia, but that’s a great idea! I’m sure it’ll work just fine in place of the erythritol. You’ll probably need 20-30 drops, or scant 1/4 teaspoon. 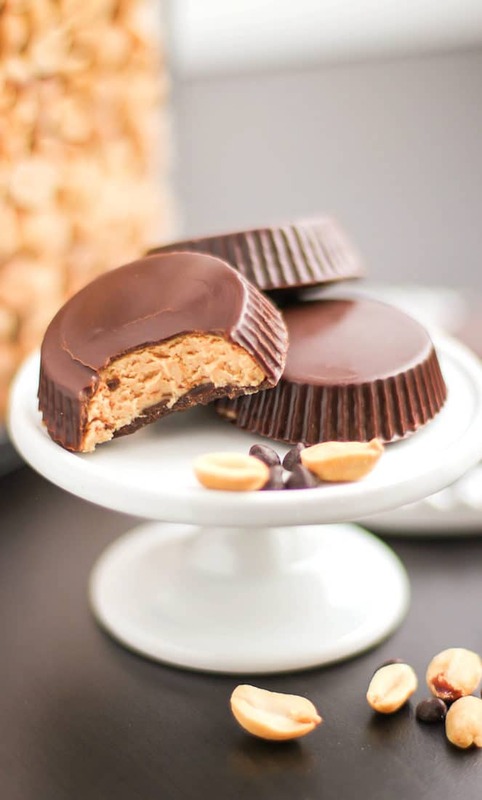 Hi, I love your recipes and would LOVE to make the peanutbutter cups! Can you please tell me, what is Erythritol ?? Having trouble finding peanut flour. Can I substitute peanut butter powder instead? What about sugar alcohol content? is there away to avoid those? Thanks for your reply and suggestions! I can’t have refined sugars and am very sensitive to sugar alcohols unfortunately. Both upset my stomach terribly. Natural sweetners are definitely better for you from a health standpoint but I was wondering if Splenda could be used? I am hoping to find some ways to enjoy a little dessert once in awhile and these rexipes sound amazing!! Pingback: Carb Academy Presents: A Low Carb Thanksgiving Feast! 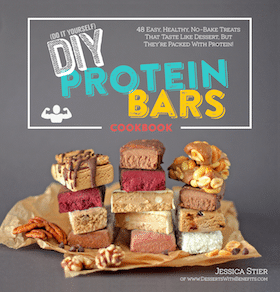 hi jess, can I make this recipe a different version without ruining it, one with higher protein?